Be warned that Hydro has become more expensive – again – on May 1. And don’t forget that mid-peak and on-peak time have switched again: it’s now MOST expensive from 11am to 5pm. Give a cheer that we in Ottawa and Ontario saved electrical energy this winter. We didn’t use as much and didn’t spend as much on hydro as the companies projected, so we’re going to be rewarded. They’ve increased our hydro rates!!! Yes, that’s our present for conserving energy. 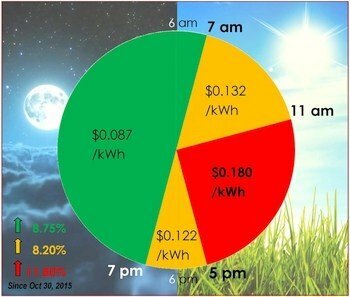 The Hydro Ottawa website says: “The total monthly bill for a typical residential customer consuming 750 kWh per month increased by approximately $3.13 per month”. Doesn’t sound so bad when they spin it that way. But they don’t bother mentioning that this is only the increase on the November and January increases! Maybe they should be legislated to limit their increases to cost-of-living? Oh, but it’s being privatized, so would that even be possible? Or perhaps we can look forward to rebates/discounted rates if we use more than they project? Electricity rates in Ontario are among the highest of any jurisdiction in North America, despite the fact that we produce even more energy than we use. In fact, Ontario Hydro pays private producers to not produce/add energy into the grid! And it dumps “excess” to other jurisdictions like Michigan for a fraction of the cost that we pay (one article suggests that it may be as high as 20% “dumped”). You should also see if you’re eligible for the Ontario Electricity Support Program (OESP) and the Low-Income Energy Assistance Program (LEAP). Minimum eligibility appears to be income of less than $28,000 for a household of 1 person, but somewhat higher incomes are eligible depending on the number of people in the household. They always had their “finger on the pulse” and without them, we would have lost the house to other interested buyers.